1. 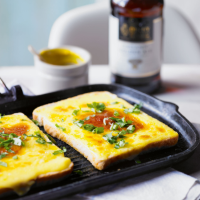 Make the rarebit sauce: mix all the ingredients except the bread and parsley in a saucepan and heat gently until the cheese has melted and the sauce is smooth and just beginning to bubble. Allow to cool slightly. 2. Meanwhile, toast the bread on one side, spread the untoasted side with the rarebit mixture and place under a preheated grill for 2-3 minutes until golden and bubbling. Serve sprinkled with parsley and a glass of the remaining ale.